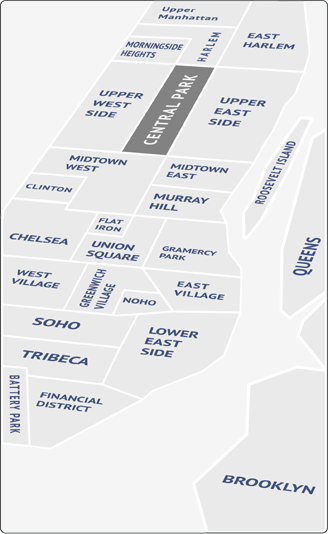 Despite its monolithic reputation, the Upper East Side, a huge area extending from 59th to 96th Street (some say 110th Street) between 5th Avenue and the East River, is home to a lot of different types. The quintessential Upper East Sider is the wealthy heiress who owns an entire townhouse on 5th Avenue overlooking Central Park. But the huge amount of available housing also attracts fresh-out-of-college types and professionals who just want a good value. The neighborhood is a mass of contradictions, staid and stifling in some parts, a boozy party in other. It’s okay though; it’s big enough to be all things to everyone. Prewars, townhouses, high-rises, luxury doorman: you name it, they got it. East of Lexington, you’ll find bargains in abundance. The farther east you go, the cheaper the rents, except of course for places right on the river. When it comes to classy eats, the Upper East Side isn't kidding. Atlantic Grill, Café Boulud, RM: the list goes on and on. Less moneyed residents needn’t fear, however: there are enough good, cheap restaurants on Second and Third Avenue to keep you happy year round. The UES’ biggest cultural attraction is Museum Mile, a stretch of Fifth Avenue that boasts the Metropolitan, the Guggenheim, the Whitney and the Frick, among others. Or, for the culture fix on a budget, check out the 92nd Street Y, with its impressive lineup of free lectures and events. For nightlife, Third Avenue is a regular meat market mile, with young pros and graduates boozing it up till the break of dawn. If your taste in clothes runs to the slightly more conservative, you’ll be right at home here, shopping at Barney’s and Hermes, among countless other fashion elder statesmen. Central Park, with its meadows, zoo and concerts is a strong argument for living on the UES. And there’s no better place for a jog or bike ride than its roadways and paths. The UES will continue to attract the extremes: young professionals looking for value and the super wealthy. Prices should stay relatively stable.